Rubin H. Landau, José Páez, Cristian C. Bordeianu, "A Survey of Computational Physics: Introductory Computational Science"
Computational physics is a rapidly growing subfield of computational science, in large part because computers can solve previously intractable problems or simulate natural processes that do not have analytic solutions. 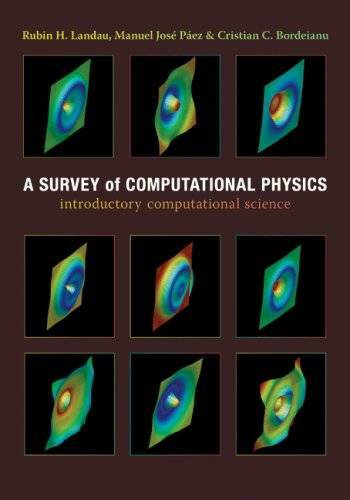 The next step beyond Landau's First Course in Scientific Computing and a follow-up to Landau and Páez's Computational Physics, this text presents a broad survey of key topics in computational physics for advanced undergraduates and beginning graduate students, including new discussions of visualization tools, wavelet analysis, molecular dynamics, and computational fluid dynamics. By treating science, applied mathematics, and computer science together, the book reveals how this knowledge base can be applied to a wider range of real-world problems than computational physics texts normally address. 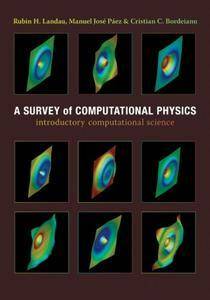 Designed for a one- or two-semester course, A Survey of Computational Physics will also interest anyone who wants a reference on or practical experience in the basics of computational physics. The text includes a CD-ROM with supplementary materials, including Java, Fortran, and C programs; animations; visualizations; color figures; interactive Java applets; codes for MPI, PVM, and OpenDX; and a PVM tutorial.